I have a tendency to concentrate on taking photos of the big rams, but the rocks and natural beauty of Zion along with these bighorn ewes and young ram made for a pretty picture. 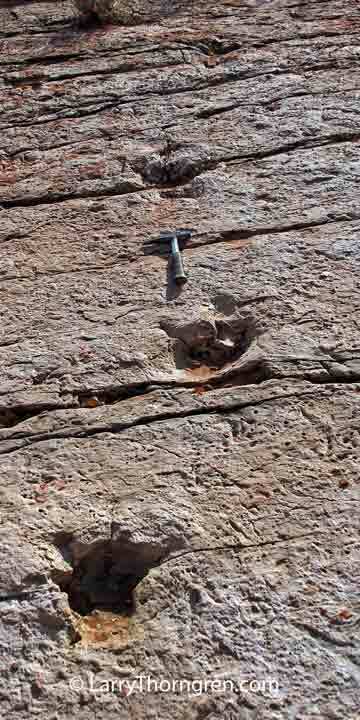 There are so many different rock types and formations in Zion that it is hard to take a bad photo. I took this photo two days ago and just had time to process it. 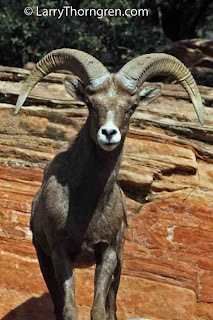 This is the largest ram I have seen in Zion since I came here two weeks ago. 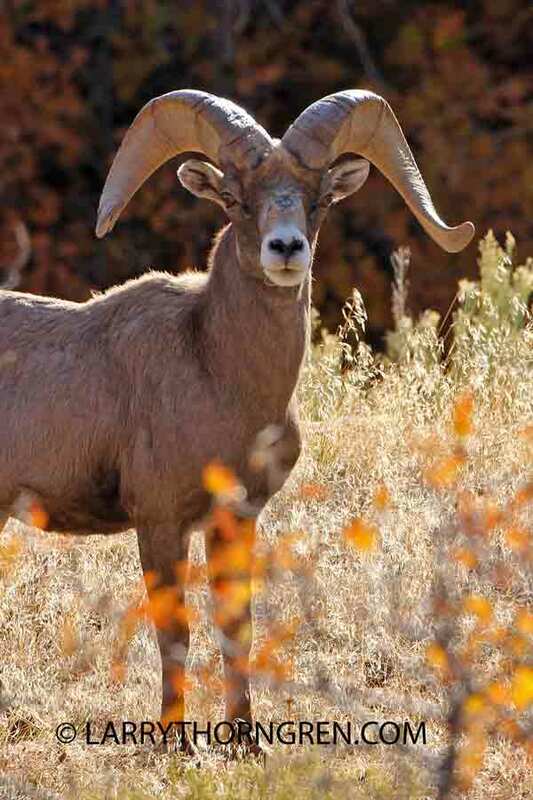 If this ram lives for another four or five years and his horns keep growing, he will be VERY impressive. 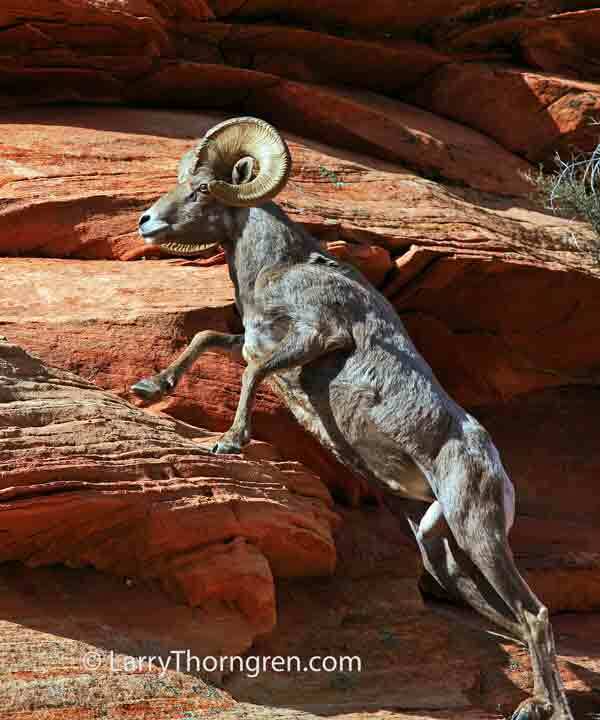 This big ram is starting his jump to the next level as he climbs a cliff in Zion National Park. Bighorns are like combination Gymnast/Rock Climbers. You can see the corded muscles in both front and back legs as he makes his move. 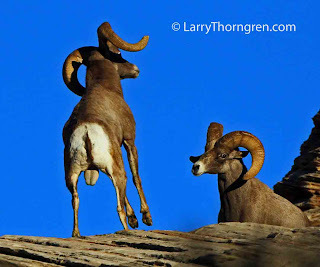 The ram on the left is about to deliver what he hopes is a crushing blow to the ram on the right. The rams are like Karate fighters and will turn their horns to strike with the sharp edge of their horns just as they make contact. 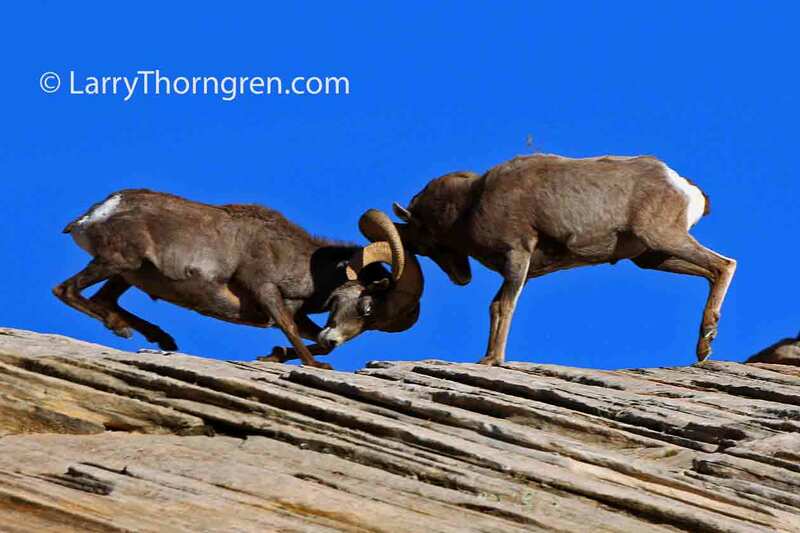 These rams were very evenly matched and fought off and on all afternoon. 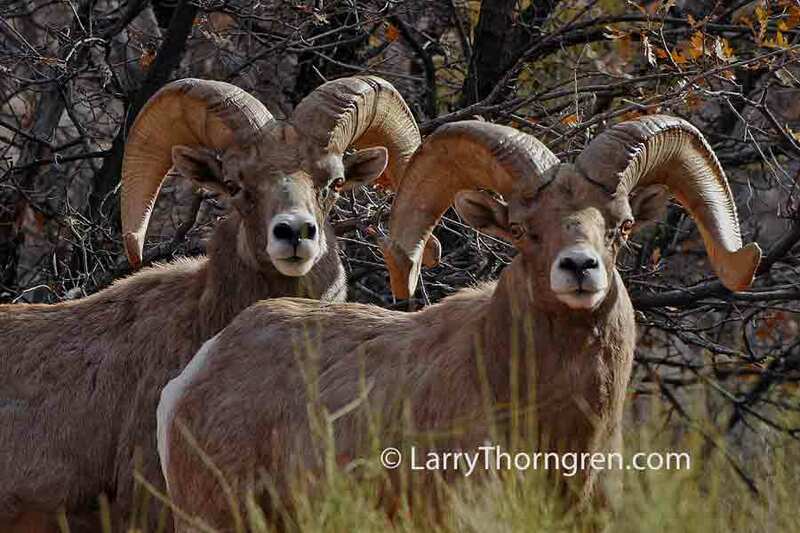 The ram on the right caught the blow with his horns and suffered no damage. I finally found some! These are the largest desert bighorn rams I have found so far. 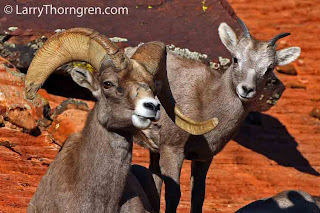 The light was harsh and too bright, but it was great to see these two rams. I got several shots of them fighting later and will post them over the next few days. I will be looking for them again tomorrow morning. This lamb has come up to stand by a mature ram who may or not be its' father. Rams join the family groups of ewes and lambs in early winter during the rut. 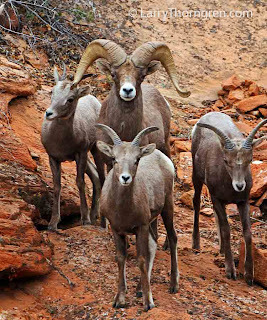 The rams usually stay with other rams in herds by themselves for most of the year, although that is not a hard and fast rule. 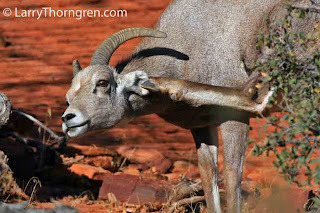 This ram has broken off the tip of his right horn during a battle with another ram. 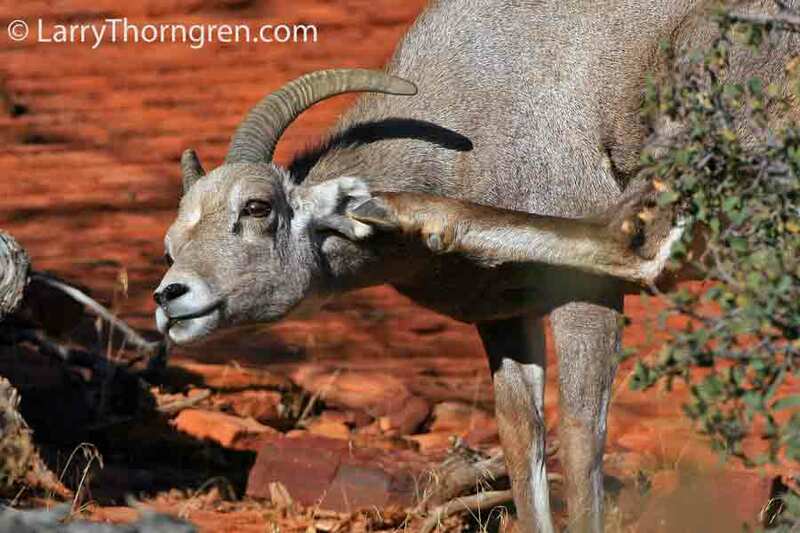 The same flexible toes that allow this Desert Bighorn Ewe to grip the rock cliffs she traverses everyday, work well to hold her ear and scratch both sides at the same time. This ram is displaying his horns to some ewes he is following. 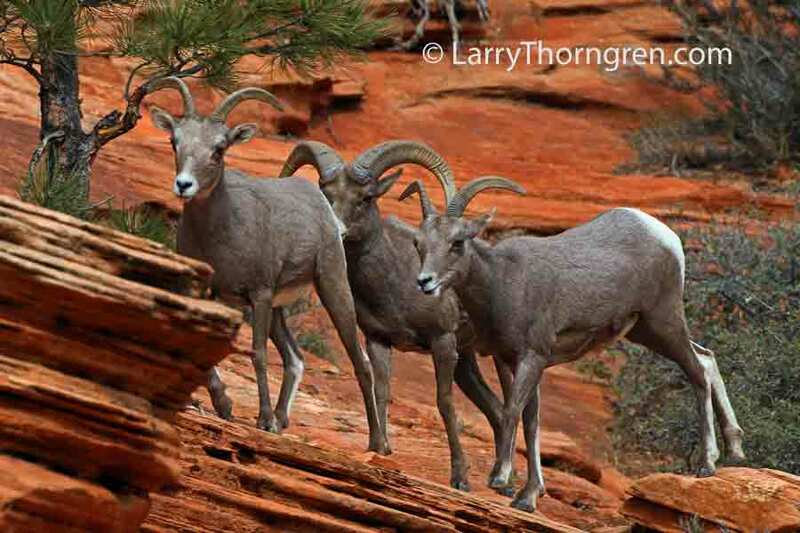 Bighorns have a number of visual displays they use to communicate to each other. The outside of his horn is keratin, just like our fingernails. It is naturally a dull white in color. The horn gets its' golden brown color from the ram butting and rubbing his head against trees and getting sap, tree bark and dirt on the horns. The horn has a bone core on the inside. I like bighorn sheep. They are easy to see and approach. They generally live in spectacular mountainous country, which is an added bonus when photographing them.. 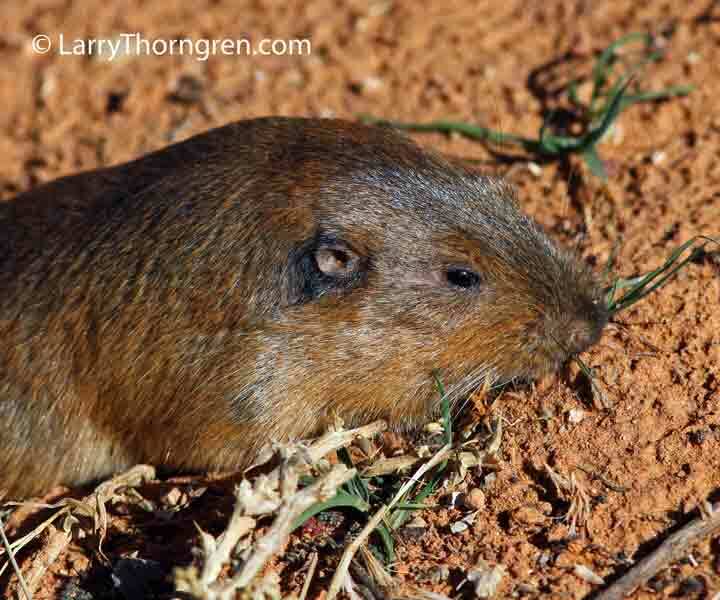 They are very susceptible to diseases carried by domestic sheep and often suffer large die offs when they come in contact with their domestic cousins. 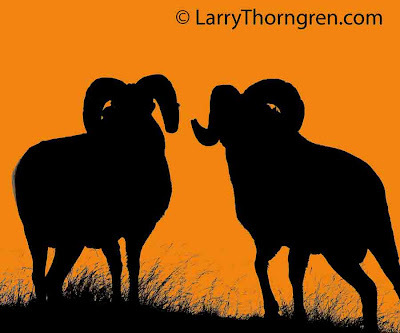 I would like to see domestic sheep banned from grazing on all public lands. This Desert Bighorn Ewe shows off her agiilty as she jumps from one rock to another. Bighorns are vey good at traveling in rough rocky country. They make moves like this one seem routine. I took this photo just a few hours ago as the sun was setting over Zion National Park. 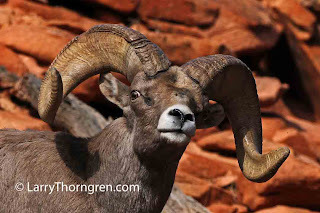 The sunlight was no longer shining in the canyon where this ram was posing, but there was enough warm light reflecting around to give this shot a nice pastel effect. This is one of the saddest scenes I have confronted as a photographer. 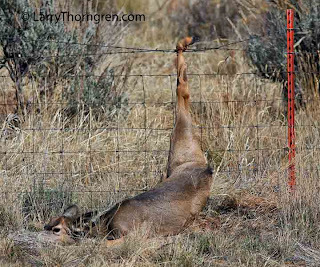 This mule deer fawn has caught its' foot in a barbed wire fence it attempted to jump. 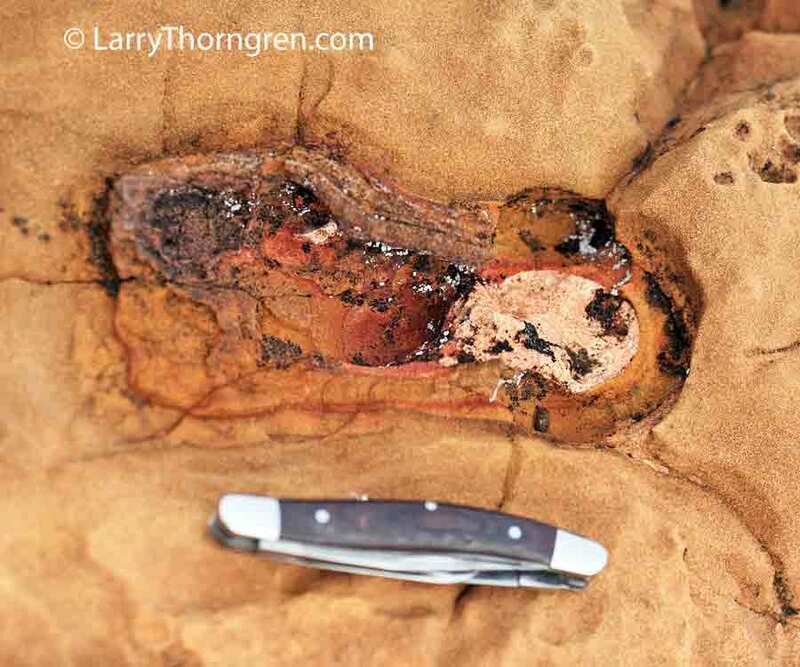 The animal was still alive when I found it today, while driving east of Zion National Park, a few miles west of Carmel Junction, Utah.. The wire had cut completely to the bone all around the foot. I attempted to cut the wire with some small pliers I had, but I couldn't cut the heavy wire. I drove to Carmel Junction and asked a cashier in the store to call the authorities and she called dispatch and they contacted a deputy sheriff to meet me at the scene. When the deputy arrived an hour later, we agreed that the best thing to do was to put the deer out of its' misery and shoot it. The deputy shot the deer and I left. 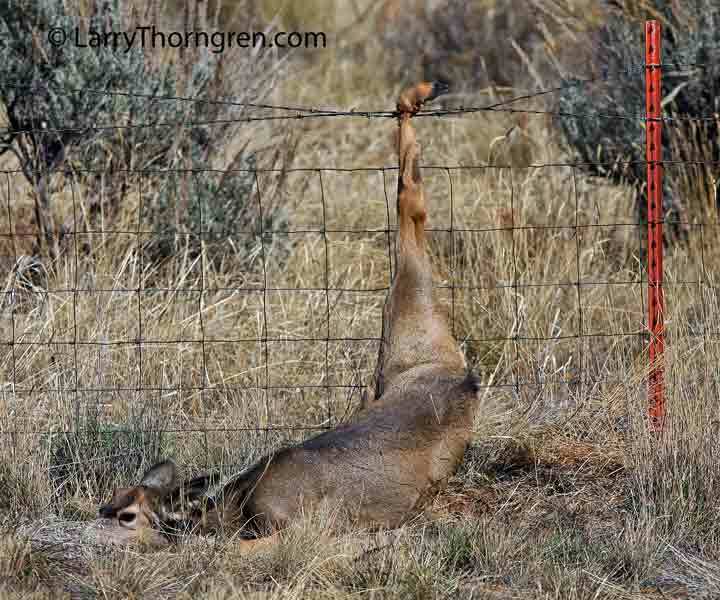 Deer often misjudge how high to lift their hind legs when jumping wire fences and the foot gets caught under the top wire and above the next wire. There is no escape from this. A slow painful death always results from being caught this way. There was a dead fawn caught in the fence the same way, less than a hundred yards from this live one. This fence was in place to keep privately owned cattle, which were grazing on Government BLM land, from getting onto the highway. My solution would be to ban private cattle and other livestock from ALL PUBLIC LANDS and remove these horrible wildlife killing fences. I went out looking for a larger ram than I photographed yesterday and I found one. 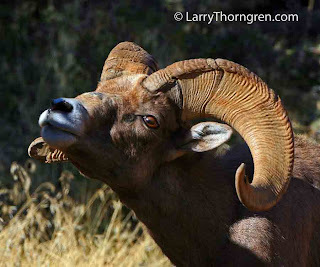 I had to shoot into the sun and a little downhill, but I did find a bigger ram. This ram has broken off some of his right horn. He would be more impressive if it hadn't been broken. He has a scar on his nose from previous battles with other rams. Now tomorrow, I hope to find an even larger ram. 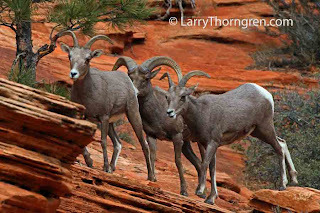 I found four groups of Desert Bighorns today. 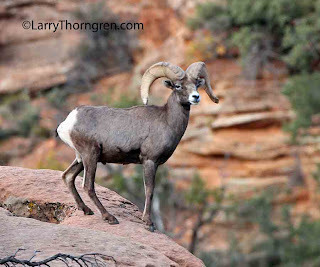 This was a young ram in the second group that I photographed . 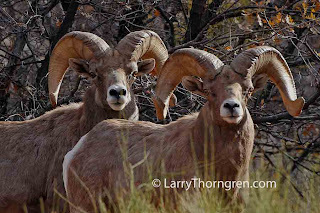 I have been told that much larger rams have been sighted in the past week, so I will be looking for them. 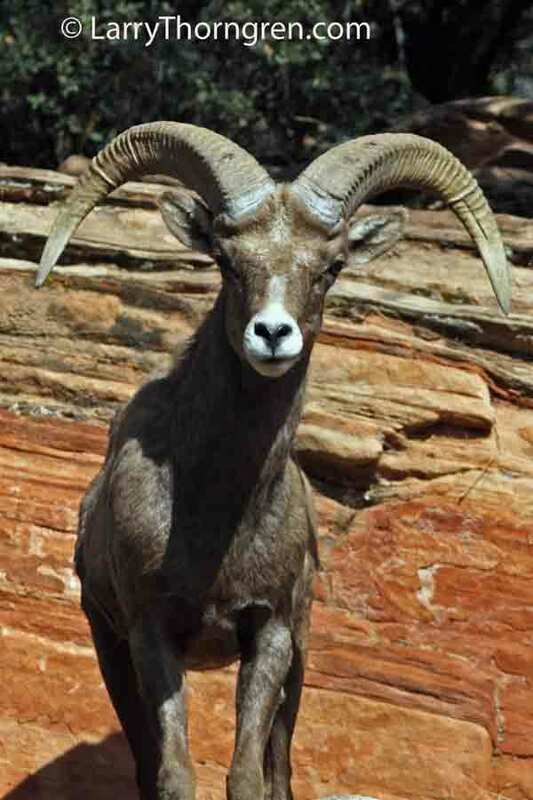 Many Desert Bighorn rams show the flared horns that this young ram has. Rocky mountain bighorns have a tighter curl and heavier horns. This radio-collared Yellowstone Bison is having a hard time feeding itself. Her hindquarters have become so emaciated and wasted that she had a difficult time getting up or lying down. I suspect that she became infected where the capture dart fired by Yellowstone researchers, when they radio-collared her, injured her in the thigh. The tight radio-collar was restricting her attempts to swallow her food. Every animal darted suffers some injury and some get infected and die. This cow bison will soon join those who die. 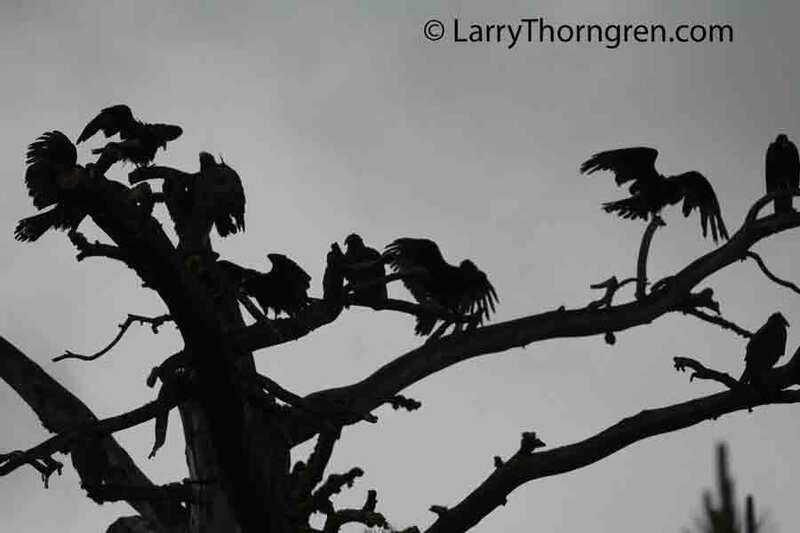 I took this photo a few weeks ago in Yellowstone. When I visit, I see rangers constantly harassing photographers and other visitors when they get too close to park animals. What they need to do is arrest the people (park employed researchers) that treat Yellowstone's animals this way. 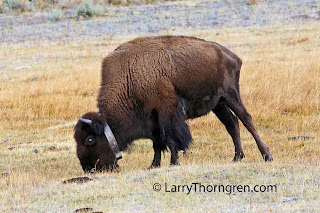 I have never seen a photographer or visitor treat an animal like this bison has been treated. It is the research idiots that do this in park after park across the United States. 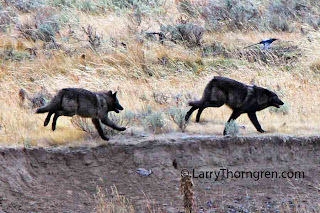 Three member of Yellowstone's Lamar Canyon Pack are seen on the bank of Soda Butte Creek, as they pause from a bout of play time. 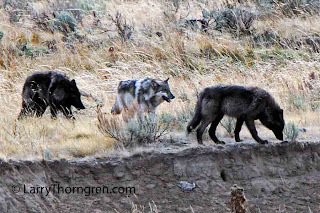 The wolves entertained watchers for over an hour while they chased each other up and down the creek bank and through the grass and sage. 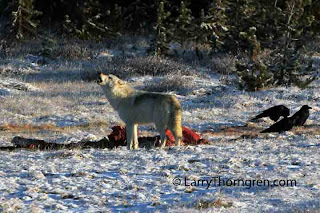 Wolves and bears seem to be avoiding roadside areas this year which makes photographing them very difficult. I think the Yellowstone staff has been shooting cracker shells at them whenever they approach roadways. I took this photo a few days ago. 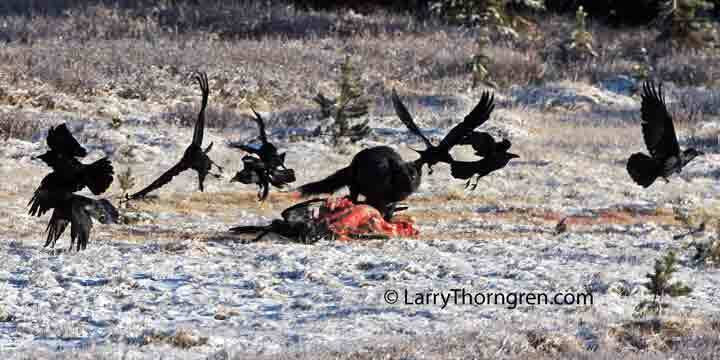 Some wolves seem to be very tolerant of ravens, while other wolves always chase them away from a kill. 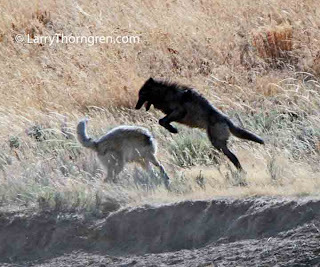 The Lamar Canyon Pack pups are playing on the bank of Soda Butte Creek in Yellowstone National Park. The pack killed an elk last night and had consumed all of it when I arrived this morning. The pups and yearlings played on the bank for over an hour. I was at least 300 yards away and had a difficult time getting good photos at that distance. I enjoyed watching the play. Wolves and dogs play in exactly the same manner. I grew up with farm dogs and I recognized all of the behavior and displays from observing our dogs as a child. 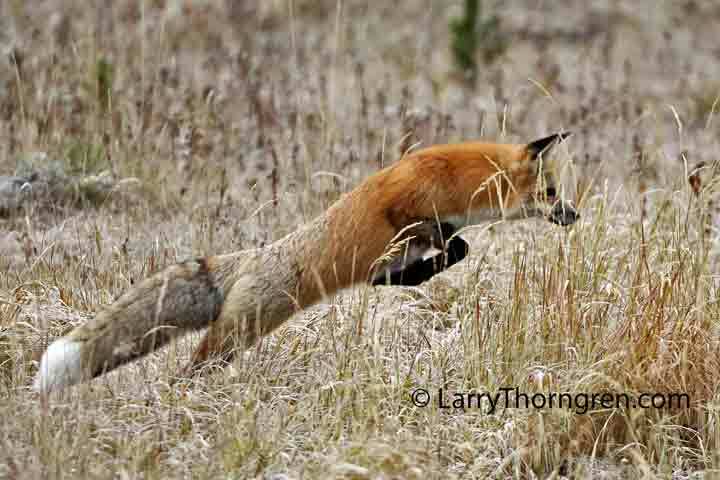 All of the hoopla about "Wolf Research " is pretty phony. Anyone who has raised dogs knows most of what there is to know about wolves.. The wolf pup on the right is approaching an adult wolf and is displaying the exact submissive, ears back, tail down pose that a domestic dog pup would use when approaching an adult dog. I am sure that the Yellowstone Wolf Study Team has about ten latin terms to describe this commonly seen behavior. 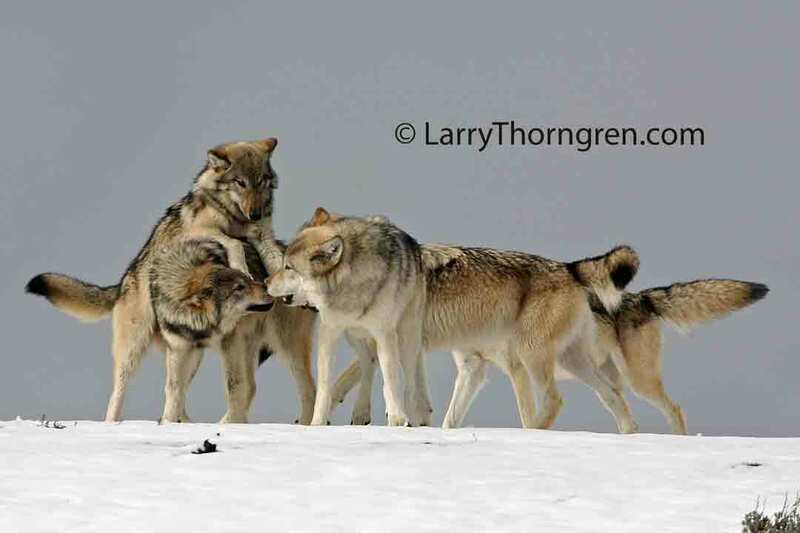 The Alpha Female of Yellowstone's Canyon Wolf Pack howls with seven of her packmates, who are howling nearby in the trees. 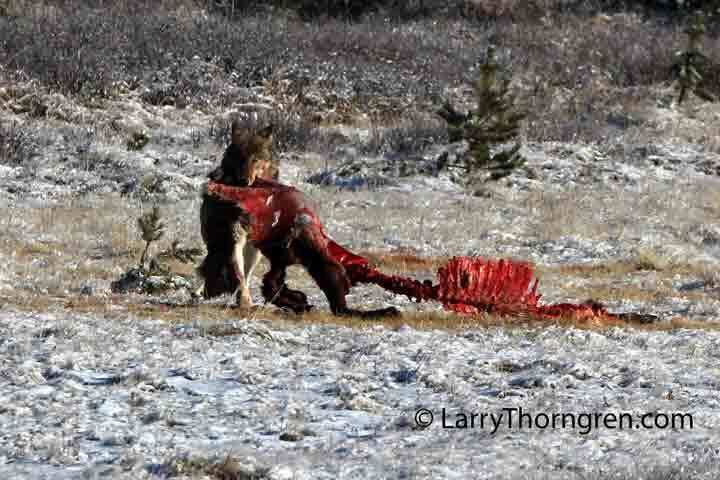 The pack has just finished eating an elk they killed during the night. I took this photo yesterday morning. A member of Yellowstone's Canyon Wolf Pack pulls on the remains of an elk that the pack killed during the night. There are eight wolves in the Canyon Pack and I was able to observe all of them today. The kill was at least 200 yards from my position, so I didn't get any closeups of the wolves. I will return in the morning just in case they are closer than they were today. 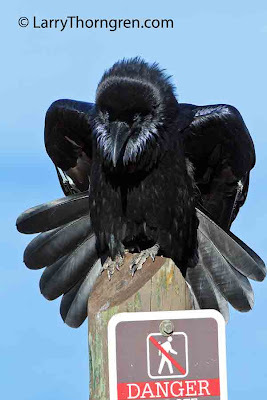 I was photographing this Raven when it decided to put on this display for me. I have never seen a Raven pose this way before. It did this display five times and I caught every pose. Maybe it knew it was sitting on this sign and just decided to look tough. The display was not directed at me. I was some distance away in my truck and used a 500mm lens. 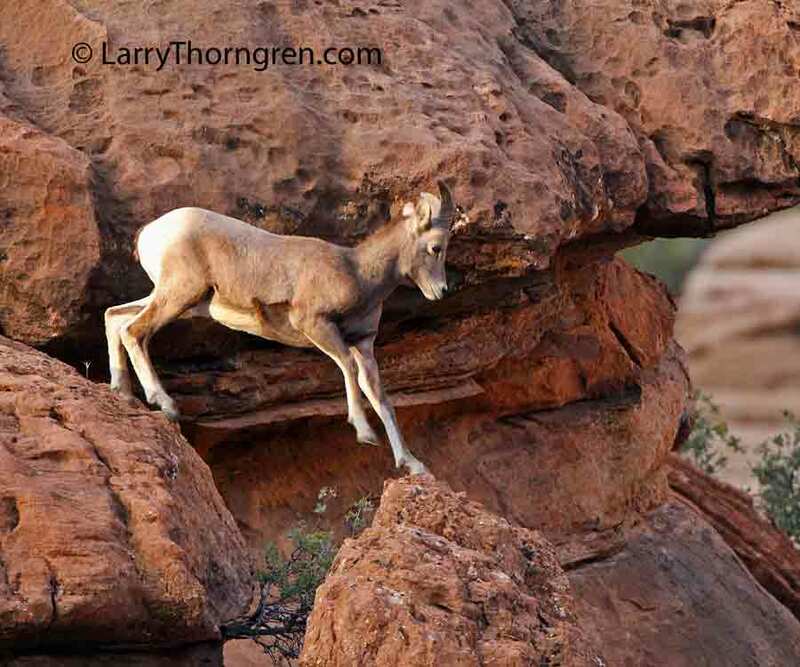 We've added some new elk photos this week on larrythorngren.com. They include this shot of a big bull in Jasper. 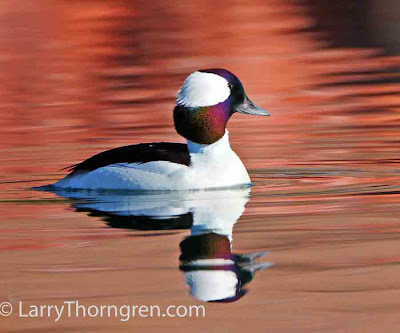 I captured this image yesterday morning on a small reservoir in Eastern Idaho. I am sure that this bird is migrating and will move to a higher lake to reproduce when it warms enough for the ice to melt. 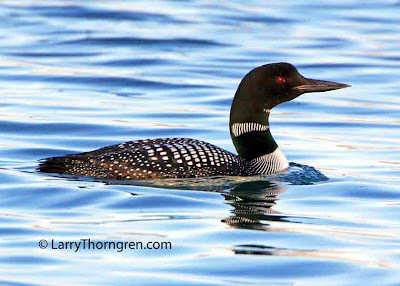 It was fun to hear the loons calling in the morning before it was light enough to take this photo. I took this photo this evening. 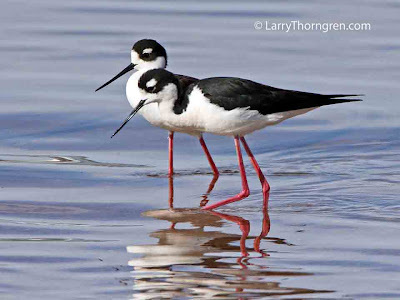 There were five Stilts in the flock, but I was only able to get two of them together. Canon 60D with 500 mm lens with 1.4 converter. 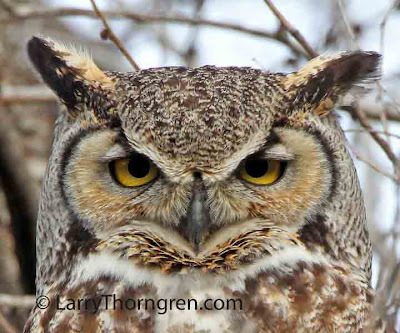 I took this photo a few weeks ago while in the Hagerman area. 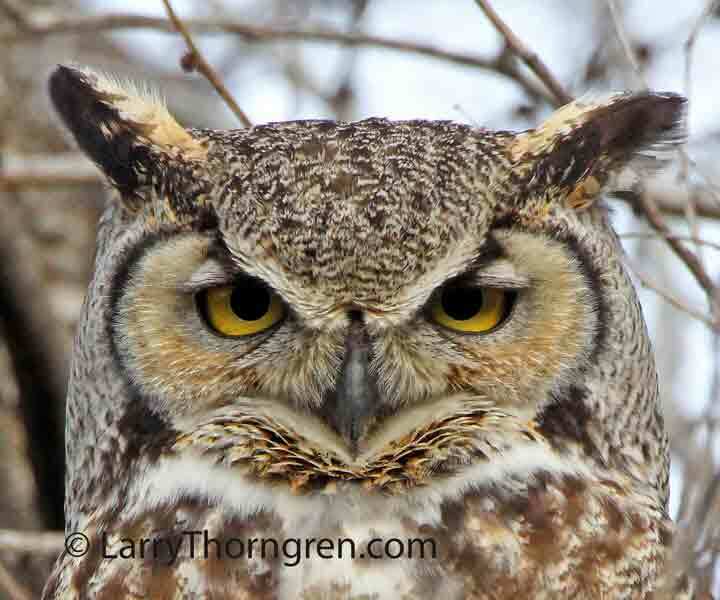 This owl would hoot all night, but I could not find a nest or any other owls nearby. Canon 60D with 5oo mm lens. 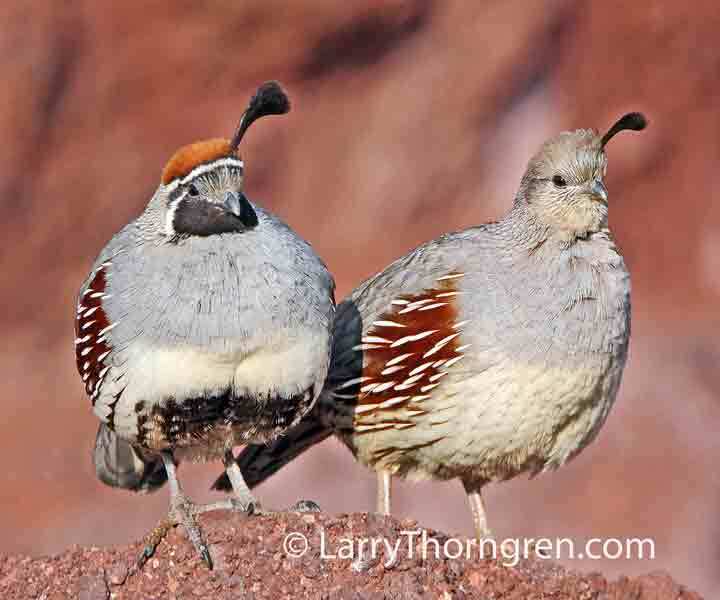 This pair of quail posed on a rock for me. This pair only has one top not feather on their heads, but I saw some that had two on their heads. I saw more with just one than I have with two, but I have no idea if the number means anything. There are lots of quail out courting right now and they will soon be sitting on eggs and hatching their young. I have been told that Road Runners will catch and eat many of the young quail before they learn to fly. 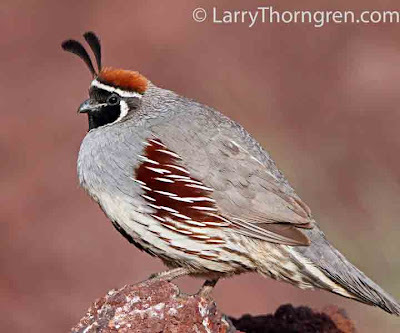 Male Gambel's Quail are starting to call to attract females here in the desert. These little quail are hard to approach and move so quickly that many of my photos of them do not turn out well. 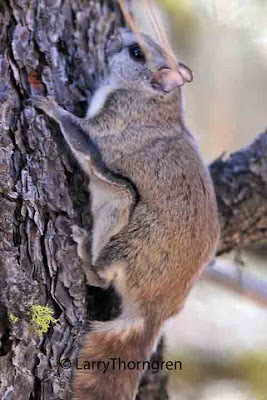 This male is sitting on a high rock so that the females can see him. 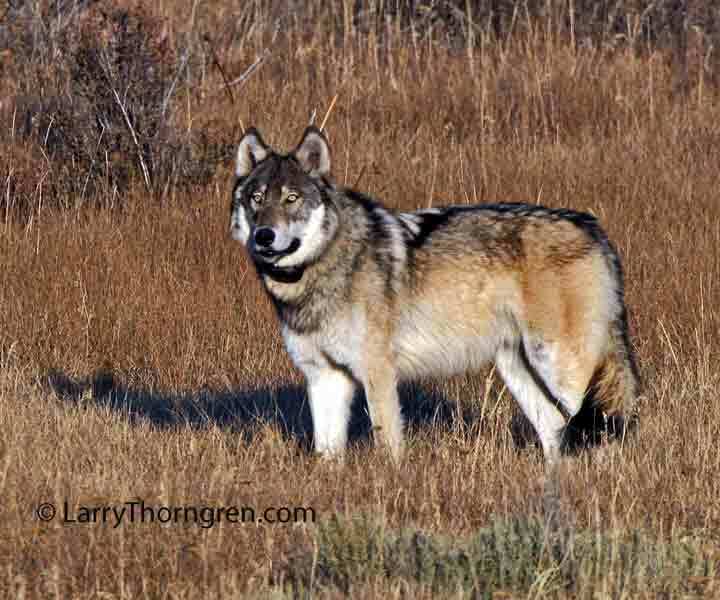 A yearling gray wolf has died within a week after being collared by by state biologists. 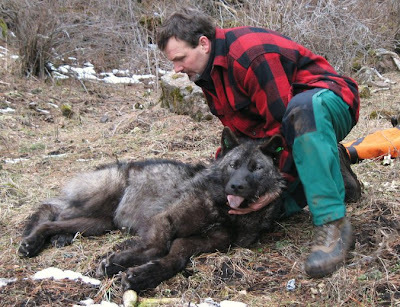 This photo is shows an Oregon biologist radio-collaring a wolf captured in a similar operation. Oregon wolves are collared so they can be tracked and killed if they get in trouble by killing or chasing domestic livestock. Wolves and other captured animals often die from the stress and over exertion caused by being trapped and captured. The fancy name for this is called "Capture Myopathy". The muscles break down and flood the kidneys with damaged muscle protein causing them to fail. A Collared Wolf Is A Dead Wolf! I was sitting out in my daughter's yard here in Boise, Idaho yesterday and was surprised and pleased to hear the call of Sandhill Cranes circling overhead. I could see about thirty of the birds circling and calling from way up in the sky. They were far too high to photograph. 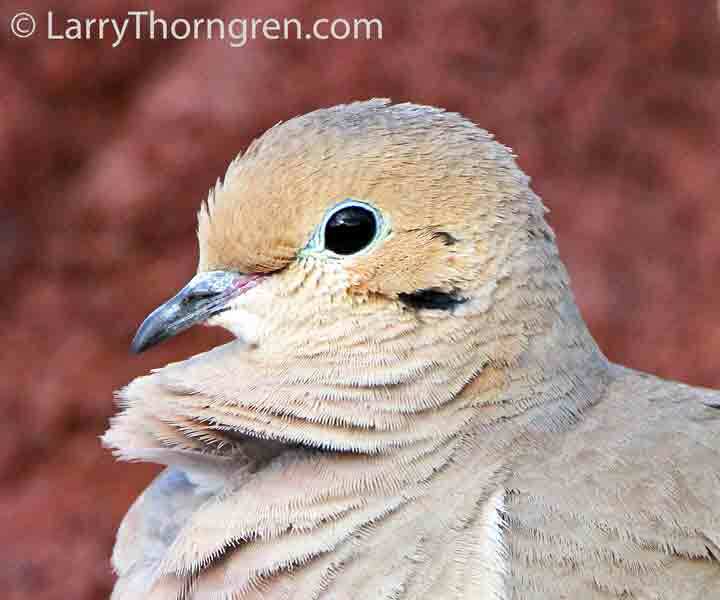 I was delighted to see them, as sandhills are one of my favorite birds to see, hear and to photograph. I was a little concerned, because they were quite near the Boise Airport. 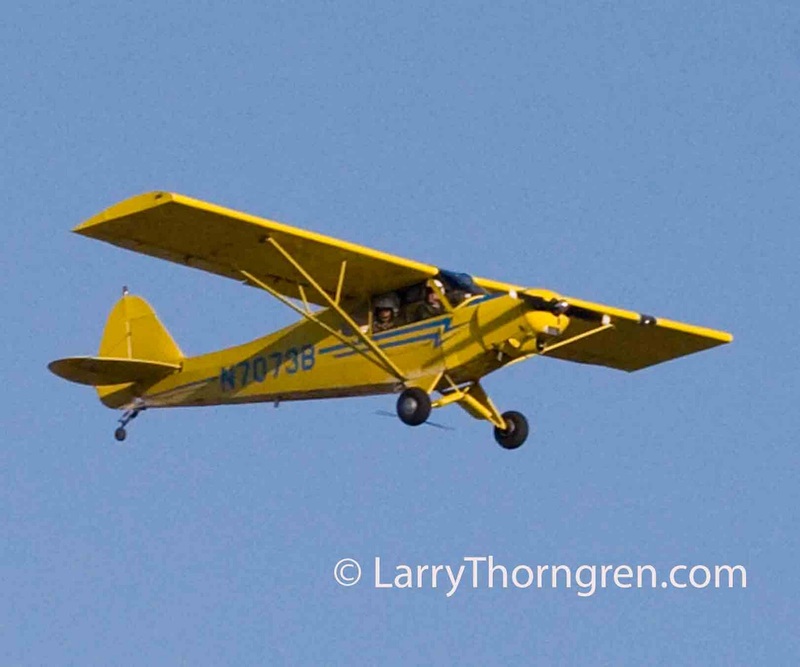 The thought of thirty large sandills colliding with a commercial jet was a little unsettling. 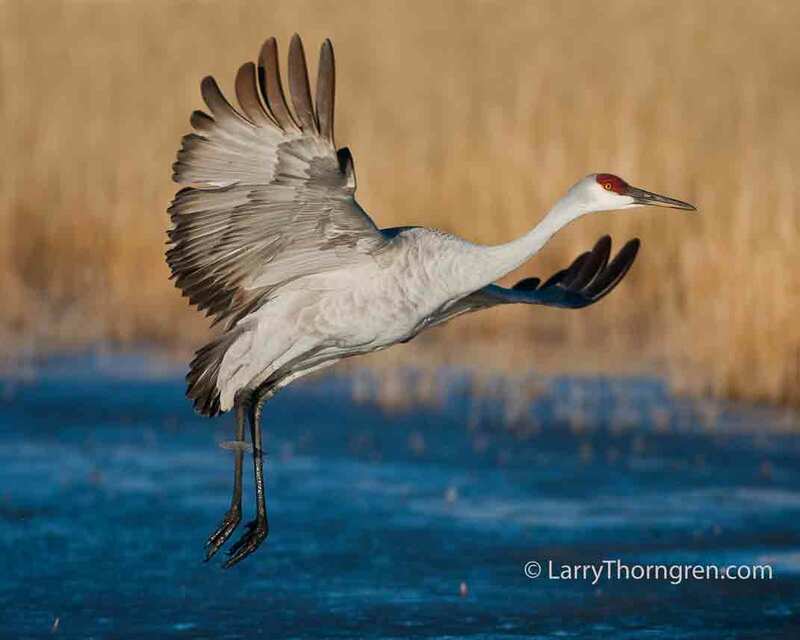 as it takes off from a partially frozen pond. A bill authorizing a $500 bounty on wolves has been drawn up for the Idaho Legislature. The bill has been drawn up by Runft and Steele Law Offices in Boise,Idaho. The proposed legislation calls for listing Idaho wolves as predators that can be shot at any time and also proposes a $500 bounty for each wolf killed. The bill calls for paying the bounties out of the Idaho Department of Fish and Game's general budget. I will post more info as it becomes available. Snow Geese will soon start flying north again. 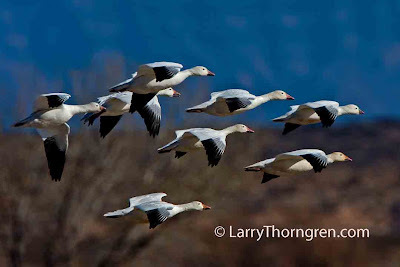 I took this photo two years ago as this flock was coming in to land. 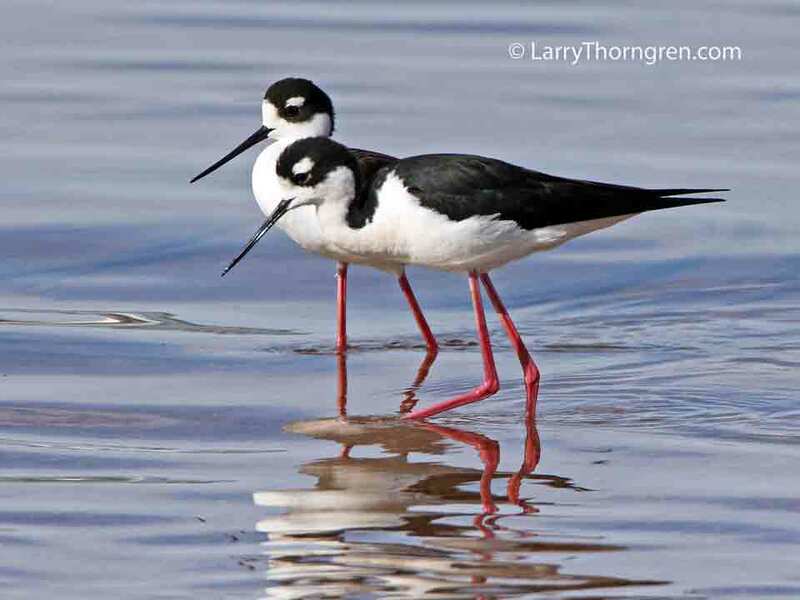 With large areas of farmland available for these birds to find food in the winter, their populations have grown so large that they tend to overwhelm their northern breeding areas and are causing damage to the environment there. This group of Yellowstone employees are about to set off to dart a Bison and put a radio collar on it. There were at least two other members of the team, but I was not able to include them in the photo. Shortly after I took this photo, I watched as the team took their radio collar, dart gun and assorted other tools and darted a Bison near Lava Creek in Yellowstone and put a radio collar on it. I have to be honest and say that I have never seen this crew put a vaginal radio transmitter in a Yellowstone Bison, but since they are the ones that do the radio collars, it stands to reason that they would do both procedures while the Bison was drugged and down. The geniuses that run Yellowstone put radio collars on twenty five Bison and vaginal radio transmitters in the females in the group in January and hazed them out of the park in an $3.3 million experiment to see what they would do.. The experiment lasted only a few days when the Bison promptly crossed the Yellowstone River to private property haystacks and had to be hauled back into Yellowstone. Two of them were shot and killed during the process. There are more than 500 Bison trying to leave Yellowstone at this time and they are being fed hay while park officials decide what to do with them. 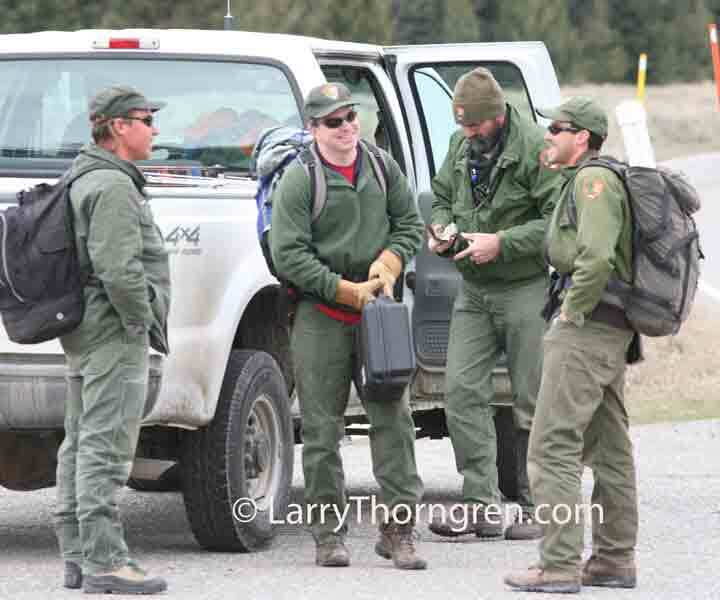 Yellowstone has been taken over by these bumbling researchers who dart , drug and collar and generally mistreat and harass many of the wildlife species in the park. 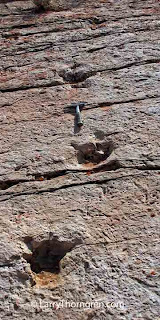 In this case two of the Bison were shot and killed. A new superintendent has just started his duties and needs to be made aware of this problem. His name is Daniel Wenk. I took this photo three years ago when the Hayden Pack posed for me right off of the road in Hayden Valley. The secret to good wolf photos is simple. 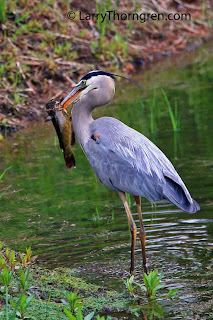 Keep showing up with your camera in areas they frequent and sooner or later they will be close enough to get photos like this. 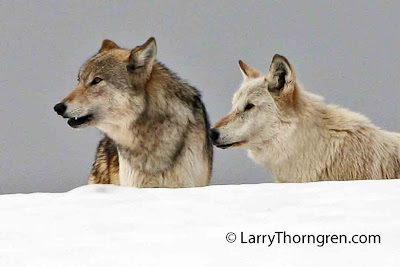 These wolves are listening to another wolf pack howling in the distance. I could hear two other packs in the area besides the Haydens. I removed the radio collar from the white wolf by using the clone tool in photoshop to cover it with fur. Half of the wolves I see in Yellowstone are radio collared, which can ruin many a good photo. 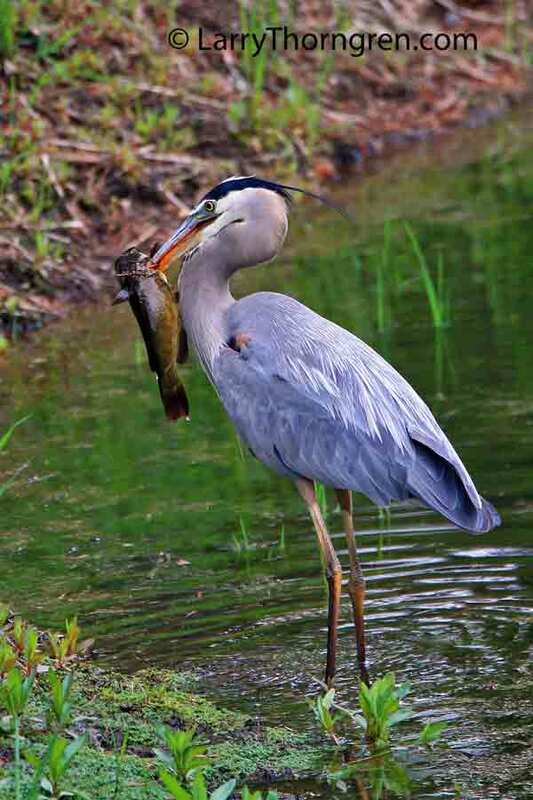 I used a Canon 40D with a 500mm Canon Lens for this photo. It was the first day that I had used the new 40D and I unknowingly had it set on JPEG without RAW and didn't discover what I had done until I finished shooting. 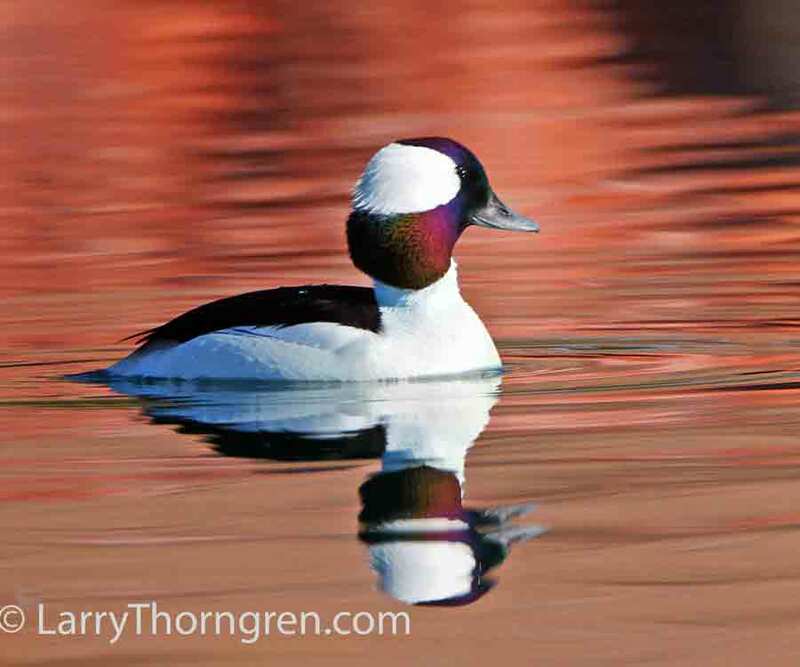 I prefer RAW for initial digital processing of my images and shoot both JPEG and RAW at the same time. Two members of Yellowstone's Canyon Pack confront a Grizzly Bear that took this Elk away from them. The Grizzly has frost on his back from sitting out all night on top of the Elk. The bear has covered the elk with grass to keep the ravens and magpies off of it. Yellowstone Grizzlies have learned to follow wolf packs in order to steal their kills. The wolves have to eat in a big hurry before the bears arrive. 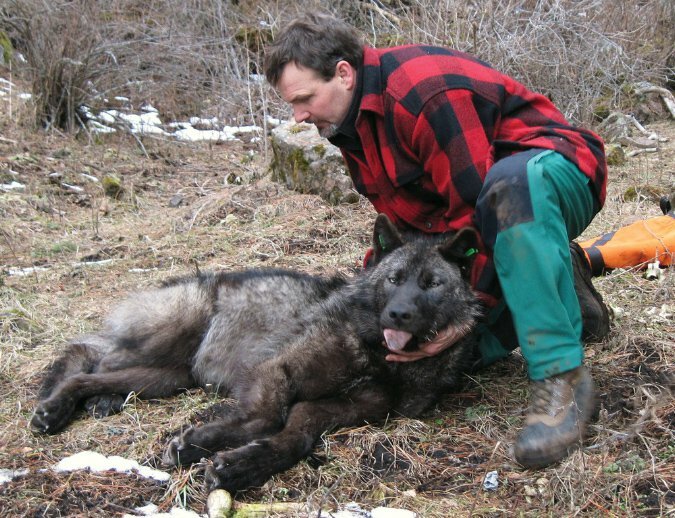 The wolf on the left is handicapped with a large radio collar and disappeared during the next year. Researchers, like the ones that collared this wolf, outnumber rangers and maintenance workers combined in some of our National Parks. This over emphasis on research has taken money away from upkeep in our parks and many park facilities are outdated and in disrepair. If you drive into Yellowstone this time of year, you will see more researchers pointing their radio antennas at collared animals, than you will rangers and other staff working in the park. I used a Canon 40D with a Canon 500mm lens and a 1.4x multiplier to get this photo.